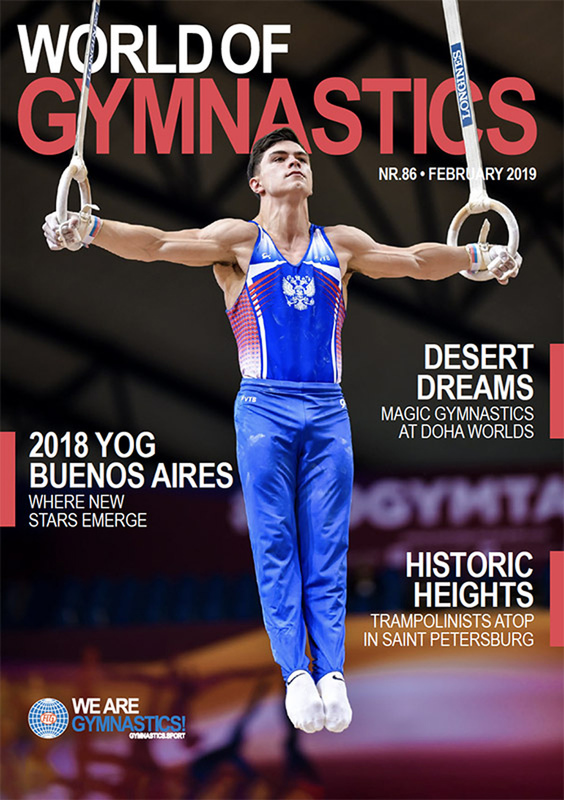 The new Artistic Gymnastics All-around world champion, Artur Dalaloyan (RUS), is pictured on the cover of the February issue of World of Gymnastics magazine, the digital version of which can now be read online in English and French. Inside, readers will find a detailed review of the Artistic Worlds in Doha, Qatar, the first Gymnastics World Championships in the Middle East, where Simone Biles (USA) won a record fourth All-around title, Dalaloyan defeated men’s defending champion Xiao Ruoteng (CHN) and the team medallists clinched the first qualification spots for the Tokyo 2020 Olympic Games. The latest issue also contains a report from the Trampoline Worlds in St Petersburg, Russia, where an exciting new team final including all disciplines was introduced. China took first place ahead of Russia in the medal standings and a grand total of 14 nations appeared on the podium as the championships returned to the city of tsars nine years after the previous edition there. Also included in the magazine is a review of the 3rd Summer Youth Olympic Games in Buenos Aires, Argentina, where Japanese men’s Artistic talent Takeru Kitazono dominated the event like no gymnast before, Acrobatic Gymnastics joined the YOG and a multi-nation, multi-discipline team format was held for the first time.